A very simple recipe for this Italian favourite. Put the olive oil in the pan, tip in the mince and cook for about 10 mins until browned. Set aside in a separate bowl. Add a little more oil and cook the onion, carrot, garlic and bacon until the bacon is cooked and the vegetables softened. Put mince back into the pan; pour in the wine, tomatoes and stock. Add the thyme leaves and oregano and stir well. Bring up to the boil, and then leave to simmer for about 30 minutes, stirring occasionally, until the sauce has reduced down and the alcohol has burnt off. Place your dried spaghetti in a pan of boiling water and cook for approx l0 minutes, or as per packet instructions. 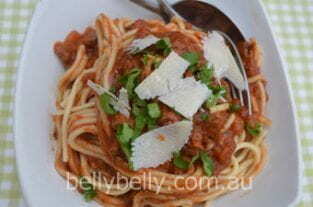 Swirl your spaghetti on to a plate and top with the bolognese mixture. Make double the amount of meat mixture and freeze the rest " use for a spiced shepherd's pie or for stuffing big tomatoes. Toast off some fresh breadcrumbs in a frying pan and use to top the bolognese for more texture. Finish with some shredded basil or parsley and a little shaved parmesan. My family love spaghetti bolognese with a half/half mix of chopped tomatoes and condensed tomato soup – it gives a beautiful, full, rich flavour and tastes a little sweeter. If that sounds good to you, give it a try!